Searching for fonts that look like Activist? Look no further! 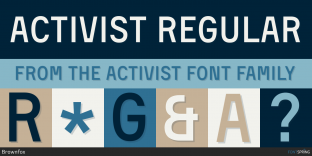 Here you will find fonts that look like Activist. 90% off until May 30th! Worry-Free! Blue Highway Typodermic Fonts Inc.
Worry-Free! Mixolydian Titling Typodermic Fonts Inc.
91% off until May 30th! 80% off until May 19th!